I may not have cooked a lot lately, but I have a lot of back-recipes just waiting to be posted. For the past week or so, I’ve been cooking on the cheap, so trying to use up things we already have at home – wild Alaskan salmon burgers from Costco, for one. They’re really good, and inexpensive, if you haven’t tried them! 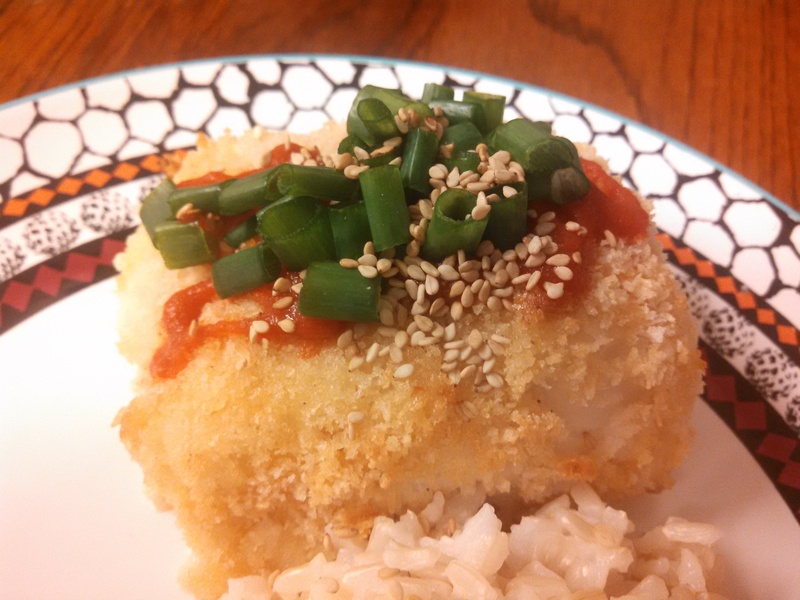 In any case, this panko crusted sriracha cod from Foodie with Family may not be for everyone, but my husband and I loved it! I went easy on the sriracha, since my husband doesn’t like things quite as spicy as I do, hehe. If you do like to be a little adventurous, like fish, and spicy food, then I would definitely recommend this dish for you. This is also another pretty quick dish to throw together! And as you can see, I did indeed add plenty of extra sriracha to my own plate! -Preheat oven to 375°F, then line a rimmed baking sheet with foil, spritz lightly with non-stick cooking spray or spray oil. Next, pour the panko crumbs into a pie plate or round cake pan. -Lay the cod filets on the prepared pan and season both sides with salt and pepper. In a small bowl, mix the mayonnaise and sriracha together until well combined. Brush the mixture over the top of each filet, then turn mayo-side down into the panko crumbs and pressy lightly to help the panko adhere to the mayo. Set the filets back onto the pan, crumb side up. -When all of the pieces have been coated, heat the butter in a frying pan over medium heat until it is melted and frothy. Place each filet gently crumb side down and fry for 2-3 minutes, or until golden brown and crunchy. Carefully return each piece of cod to the prepared pan, crunchy crumb crust side up. Bake for 10-20 minutes, depending on the thickness of the filet, or until opaque throughout and easily flaked with a fork. The internal temperature of cod should reach 145°F to be done. Remove the pan from the oven and let rest for 3-5 minutes before plating or transferring to a serving dish. 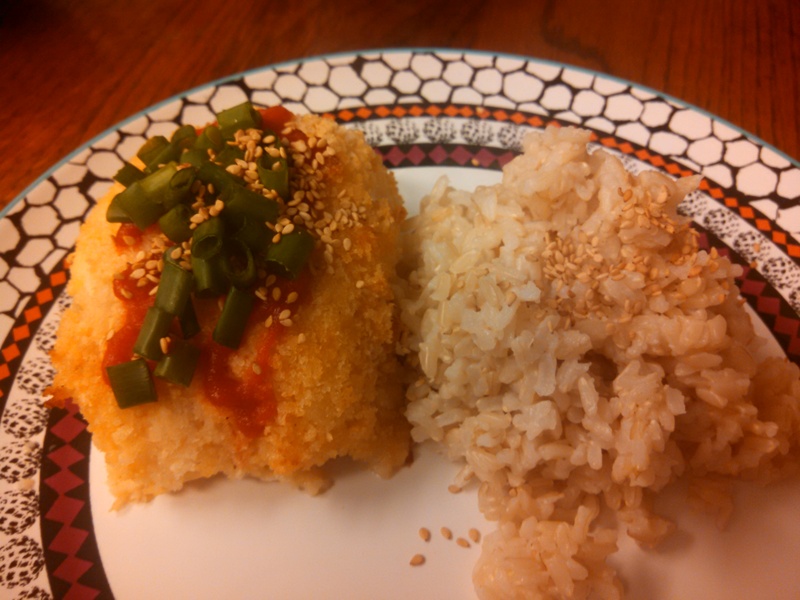 -Garnish with additional sriracha, thinly sliced green onions and toasted sesame seeds. Serve with desired accompaniment.